This was a great start in teaching my baby to eat. She enjoyed the flavour and we have great memories with her learning to spit it around! Will definitely use this product again! I was so grateful to have this available when my second was moving onto solids. I could just carry a jar around and feed him anytime. A favourite. 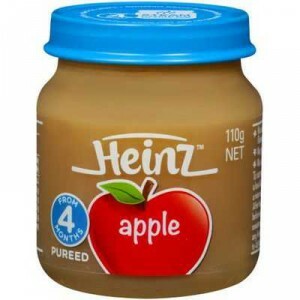 We love the apple Heinz jar…to mis in and add a bit of sweetness to bubs first foods, use in baking and for a healthy sweet treat for toddlers! I bought my daughter’s first jar of this the other day. I have just started her on solids and have been feeding her homemade pureed apple but needed to have something more convenient for travelling. This was the ideal solution. Tried my daughter on these purees as her first food. She loved it. Still does. Onto 6/8 month fruits now and still can’t get enough. Love all Heinz! Not too fussed for containers, would prefer fresh purred done by mummy. I dont know either cuz i dont know what has been put in. They say one thing could be another thing. So my sons always managed to go off vegetables and one of the only ways to get them to eat it was to add this!! How would you rate Heinz Pureed Food 4 Months Fruity Apple?